The most interesting thing about this question is that typically anyone asking how much money can you make blogging most likely falls into that I haven't started a blog yet category. Now that isn't said to be critical about anyone interested in blogging, however if there's something that you should adopt first is an understanding that your audience doesn't care about the money you're making. Your audience typically doesn't care beyond casual curiosity what dollars you're lining your pockets with through your blogging efforts. It's all too easy to highlight Darren Rowse that has made and continues to make thousands of dollars blogging from his two blogs Problogger and Copyblogger. However, in spite of the Cinderella story that is Mr. Rowse, most will not and do not follow the yellow brick road to blogging riches. To focus on the money dismisses what's more important, yeah I said it.. "what's more important".. that oh so important piece of the puzzle.. your audience and why they are visiting your blog in the first place. Value is more important than the money. 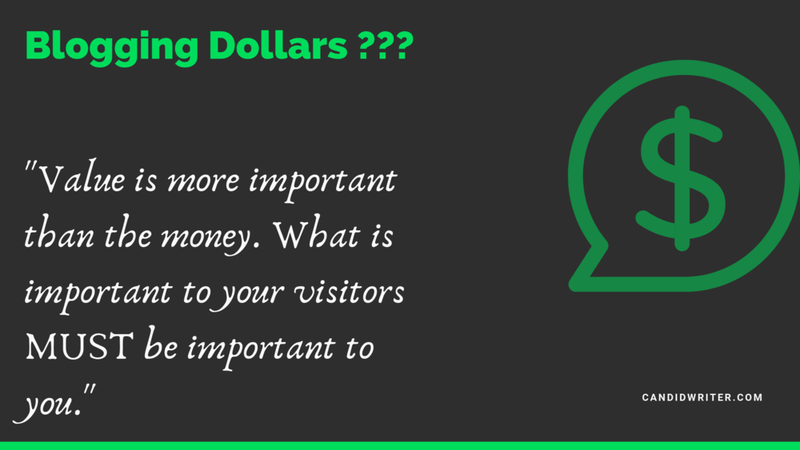 What is important to your visitors MUST be important to you. In the long term goal of your blog... in the larger scheme of things.. if you aren't adding value to the people that are coming to view your blog then you're not going to make much money either. Value and money are closely related and if you demonstrate an interest in meeting the needs of your audience that will translate into revenue for you and it becomes a winning situation for both you and them. The question shouldn't be how much money can you make blogging. The question should revolve around how to answer your audiences questions, how to provide more insight and be a better sharer of information that is useful to your visitors. When you're able to do that consistently and successfully, revenue will come along as well as a natural part of the process. As your traffic base grows, as your content provides meaning and engagement to your visitors, generating revenue will be something you can no longer ignore. When that moment arrives, diversifying your income streams will become very important. There are several methods to generate revenue that can work for any niche that you're blogging about, however if there's anything that you should take from this post, it is to remember... Build an audience first and then engage them with content that matters.